I ordered a little carrying case the other day from Amazon. It came in an assortment of six styles, but there was a catch. I could not choose which of the assortment I was going to receive. Because the item was so inexpensive, they could not bother with allowing me to specify which style I would prefer. So in exchange for a great price, I would concede the ability to choose my style and throw that open to chance (or to the whims of the person packing my order). The designs were all pictures of cats. I am not particularly a cat fan. I am not particularly a non-cat fan either, mind you. Under some circumstances, Fluffy and I might even own a cat. But we entertain far too many people to bring a cat into our house whose dander might keep allergic people away. That and — well, Fluffy has enough work to do cleaning up after two people without adding a furry poop machine to the mix. But all this is neither here nor there. I like cats fine, but I do not like cats enough that cats would be my first, second, or even five hundredth choice of design selection for a carrying case. But I needed a carrying case for the bedroom, and the price was right if I ordered one with cats on it and was willing to take a chance on which cat picture would be sent to me randomly. I inspected the designs. The designer is one of my favorites — or “was,” seeing as how she is as dead as a mackerel. And I absolutely loved five of the six cat designs (or loved them as much as I would love any designs that featured cats, anyway). 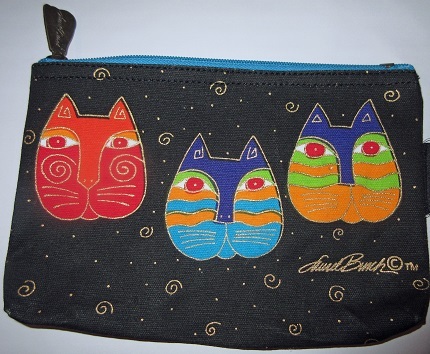 The sixth cat design featured three disembodied cat heads and was ug-ug-ugly. The odds were five out of six that I was going to get a design that I liked. I liked those odds, so I quick-like-a-bunny clicked the buy-it-now option and bought a carrying case. Normally, I do not wait with bated breath for packages from Amazon, but this was one time I have to admit I was more than a little anxious. I really wanted to know which case I was going to get. No. Scratch that. I was certain which case I was going to get. I was just waiting for the confirmation. The case was waiting for us in the mailbox on the morning when Fluffy and I were driving off to the temple. As soon as he came back from the mailbox, he handed me the oversized envelope and I ripped it open. Sure enough, the three disembodied cats of the design I hated stared up at me. I laughed long and loud. The disembodied cat monstrosities behind door #6. You know, I’m going to hate that cat carrying case every time I look at it. Boy, is it ugly! But every time I look at it, it’s going to remind me of just how blessed I am. If the biggest problem I have is that I get the ugliest cat in a random cat selection of cat carrying cases, I’m one lucky human being. In fact, you could say I’m rolling in catnip. I had a similar experience recently with an orthopedic surgeon. I just couldn’t stand the pain in my knees anymore, so when a friend told me he had a pretty good joint doctor, off I went. This doctor (or rather an assistant) took a series of x-rays, and they told me something I didn’t think was possible. I have zero cartilage in my knees. There isn’t a speck of it anywhere. I would have thought there was some of it left in places that were a little less used. Indeed, I thought I saw some on the x-ray and pointed it out, but the x-ray technician told me I was mistaken. No, there was zip. Zero. Nada. Anywhere. If I still had any cartilage in my knees, it had chosen that week to be attending a cartilage convention in central Cleveland. To my surprise, all was not lost. There was a series of hyaluronic acid injections I could take in my knees every six months to alleviate the pain. The shots wouldn’t even hurt, and they would be using a chemical that occurs naturally in the body anyway. “Bring ‘em on,” I said. I walked out of the doctor’s office (or rather rolled, seeing as how I was in a wheelchair) a new person. It was as though I had brand new knees. I could not believe the miracle. Every time I flexed or extended my knees I thanked God for the change in my life. And this series of shots was supposed to last for up to eight months. I couldn’t believe how blessed how I was. I took the shots in April and May. The effects had worn off by the Fourth of July. I can’t take them again until October. Oh well. At least, for two months out of the year, I am going to be pain-free. What a joy that is! I will be rolling in the clover. Halloween will be a happy time for me. Maybe I will even dress up in a disembodied cat head costume. Until then, I have the cat carrying case to remind me that there is always something in life to make me smile. Things like that used to annoy me. But as I have grown older (and hopefully wiser), I find that God has a pretty delightful sense of humor, and it’s just easier to laugh right along with Him.